Our artists and weavers are the centerpiece of Artemisia and we are proud to represent them in Taos. We have a long, successful history with our favorite designers, such as New Mexico weavers Nancy Paap, Barbara Ehrlich, and Elizabeth Jenkins, Tennessee silk and velvet artist Lisa Mergen, Florida fiber artist Kathy Skomsky, and handpainted silks from Alexis Abrams in California – just to mention a few. We continue to bring you extraordinary knitwear and new needle felted creations from Renata Z, elegant handwoven shawls from Lore Wills, and a stunning collection of one-of-a-kind handwovens from Sandra Doak and Cathy Swindle at Studio 3 in Austin. Colleen Launer Yarbrough with Heartwoven Designs has moved her loom to Taos and offers us first choice when she completes another of her one-of-a-kind handwovens. We also represent Santa Fe textile artist, Natasha Nargis, who works mostly with hand dyed linen, silk, cotton, cashmere and alpaca fibers to create subtle tones and understated color in her tops, tunics and scarves. Her son, Karim S. Jaekel, works with cotton and linen and we always have at least one of his beautiful lightweight ruanas. 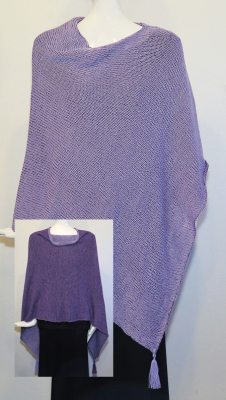 Bobbie Sumberg, with KNIT in Santa Fe, creates contemporary reversible knit ponchos and lightweight ponchettes. Over the past few years we have added to our list of fiber artists working with nuno felted silk and wool. Each artist has a unique style which is evident in the wide variety of felted wearables that we offer. Award winning Los Alamos fiber artist, Maggy Pavlou, creates a new collection for spring/summer and then again in the fall. We always look forward to seeing what's been happening in the studio with New Mexico's own Linda St. Angelo and Anne Vickrey Evans. Colorado fiber artists, Perla Kopeloff and Rebecca Gilberto, round out our growing list of cutting edge fiber artists. Each season we strive to add new names to our hand picked selection of weavers and artists. We are pleased to be one of only a few galleries selected to represent the weaving of Teri D. Inman with Bristol Yarnworks Studio. We also welcome Taos fiber artist, Faith Welsh, who creates whimsical free form wearables by fusing knit, crochet and color. We recently added Linda Johns to our gallery of weavers. Linda works in mostly tencel and/or chenille to create her beautiful shawls and scarves. has been with Artemisia for quite a few years now – and we just love to show and sell her wovens! Beautiful, rich colors, accented by stencil work and contrast bands of colors. Each piece is hand woven by Barbara in her studio – no production work done by other weavers for her! It certainly shows in the impeccable craftsmanship and loving details in each of her handwoven pieces. Always evolving, she recently added a mobius shawl to her collection and we can't keep them in the store! walked into Artemisia years ago, when she was looking for wearable art to sell in her Memphis store. We have turned the tables and are now ordering from Lisa to keep up with the demand for her exquisite silk painted tops and tunics, her fun "skinny mini" scarves, and her silk gauze vests. Lisa is one of our all time favorite artists: Her remarkable sense of color, her incredible craftsmanship, and her always reliable deliveries are what makes her our go-to girl when our customers want to see more! is from California and we started carrying a few of her garments and discovered very quickly that our customers just love Alexis' hand painted silk and linen shirts and jackets. Quite a few custom orders are going her way, as Alexis graciously accommodates all sorts of suggestions and requests. is one of the original founders of the Santa Fe weaving gallery. She discovered after a few years that her heart is in the artistry of weaving, not in running a business, so she went back to exclusively pursue the art of weaving. Lucky us! We have carried her unique, truly one of a kind, one at a time, hand woven pieces at Artemisia for many years now, and we always look forward to visiting her studio in Tesuque to select pieces for Artemisia. We started showing Kathy's artwear pieces in the summer of 2014 – and we are so glad we did! Kathy's fun and funky, and oh so wearable, denim redoo and altered eco jackets, vests and tops continue to be a hit with our customers. Every single piece is created by Kathy in her Fort Lauderdale studio and is truly one-of-a-kind. We get special requests to copy a piece, but know it's just not going to happen! We are pleased to continue to represent the award-winning wearable art of New Mexico Felt Artist, Maggy Pavlou. Her exceptional designs are the result of her continued exploration of new ways to fuse various fibers to create soft, lightweight artisanal cloth that is suitable for contemporary clothing designs. Santa Fe fiber artist, Natasha Nargis, came to us with her shibori dyed scarves, but once we laid eyes on her hand dyed and handwoven creations, we knew we had to have them in the store. She uses only the finest fibers and a variety of dye techniques, with shibori being a favorite, to create wearables that are vibrant in texture and color. Taos since 1978. She came to me about a year after I purchased the store and said she had customers ask why she wasn't in Artemisia! We tried a small collection and the rest is history. Her palette of fibers in silk, cotton, rayon, wool and mohair is brilliant. Her styles are contemporary, with influences from indigenous cultures around the world and we are pleased to represent her handwovens at Artemisia. Renata Zimmermann creates one-of-a-kind, original handloomed garments, inspired by her life in beautiful New Mexico. Last year she added needle felted vests, jackets and silk scarves to her collection. We still have a few of her knit one-button sweaters, fiesta coats and capes, and knit shrugs. Linda grew up in New Mexico and being exposed to a variety of art had a significant influence on Linda becoming an artist. She designs one of a kind “wearable art” pieces using the softest Merino Wool roving and different types of woven silk from Uzbekistan Thailand and China, and often incorporates various exotic fibers such as silk, yak, bamboo, Seacell, pearl, etc., to give her pieces different looks and feels. If you'd like to see more of the work of any of the designers featured here, please give us a call or send us an email. We have an excellent selection of designs and styles available from each designer, and would be very happy to send you pictures of currently available garments. You might also find what you're looking for on our Online Shop .